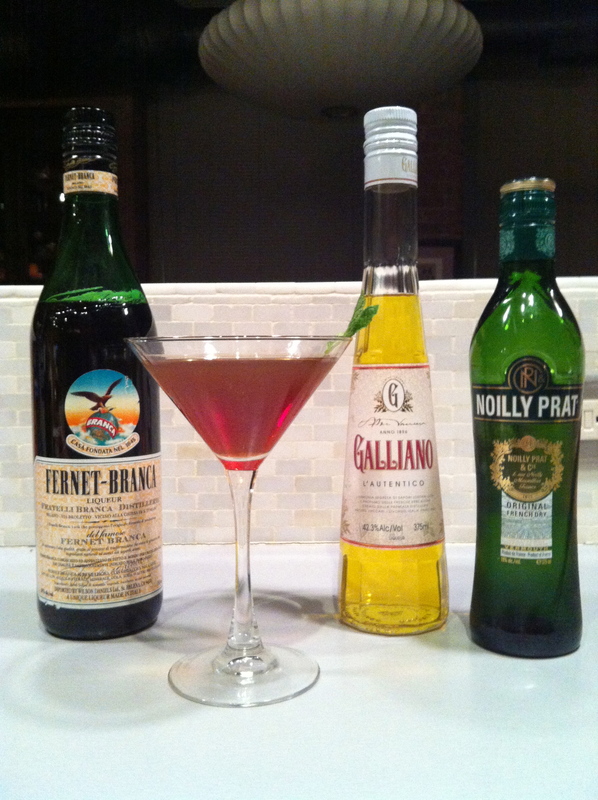 Preparation: Combine all of the ingredients except the Green Chartreuse in a mixing glass. Dry shake first and then shake for 20 seconds in an ice-filled cocktail shaker. 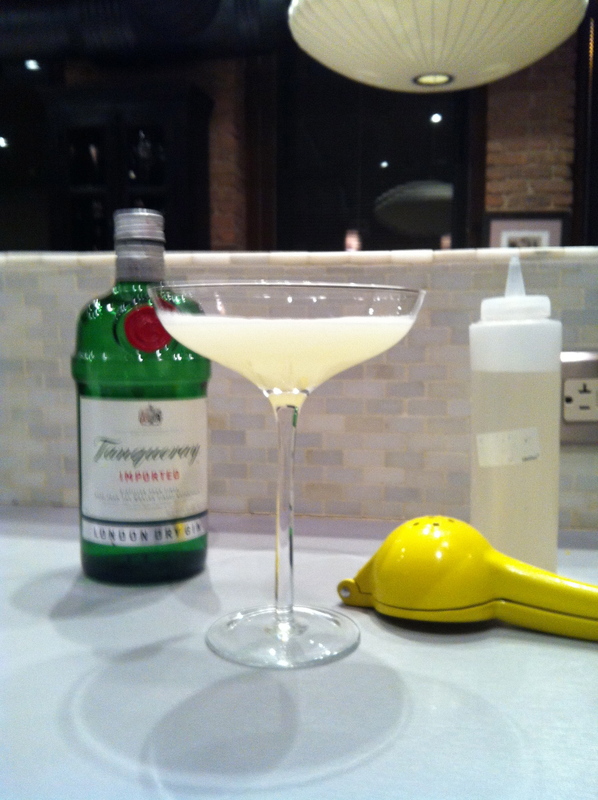 Strain into a coupe glass and then pour .5 oz of flaming Green Chartreuse VEP over the surface of the drink. 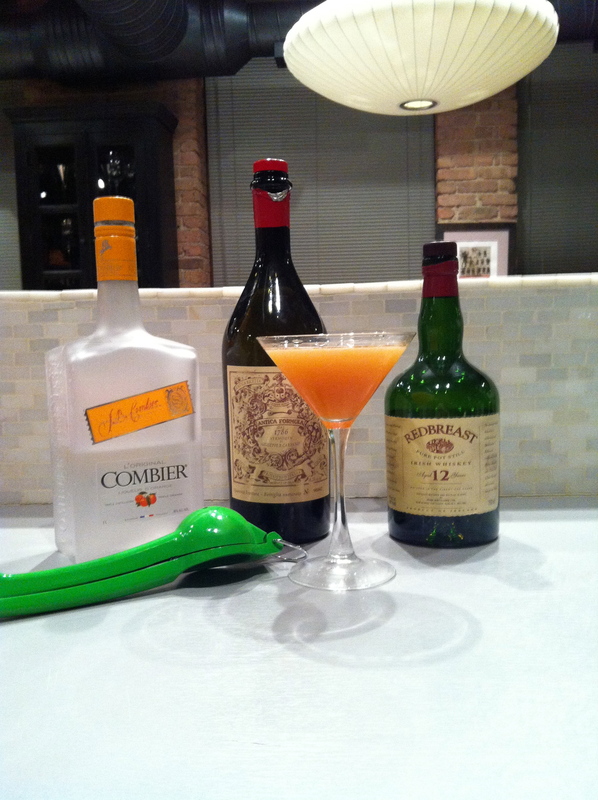 This recipe is attributed to Cervantes Ramirez of PDT in New York City and is found in The PDT Cocktail Book. I didn’t have Green Chartreuse VEP so I substituted regular Green Chartreuse instead. Interestingly, I liked the drink a lot before the Green Chartreuse was added. Preparation: Combine ingredients in an ice-filled mixing glass. Shake for 15 seconds. Strain into a salt-rimmed cocktail glass. Garnish with a lime wedge. 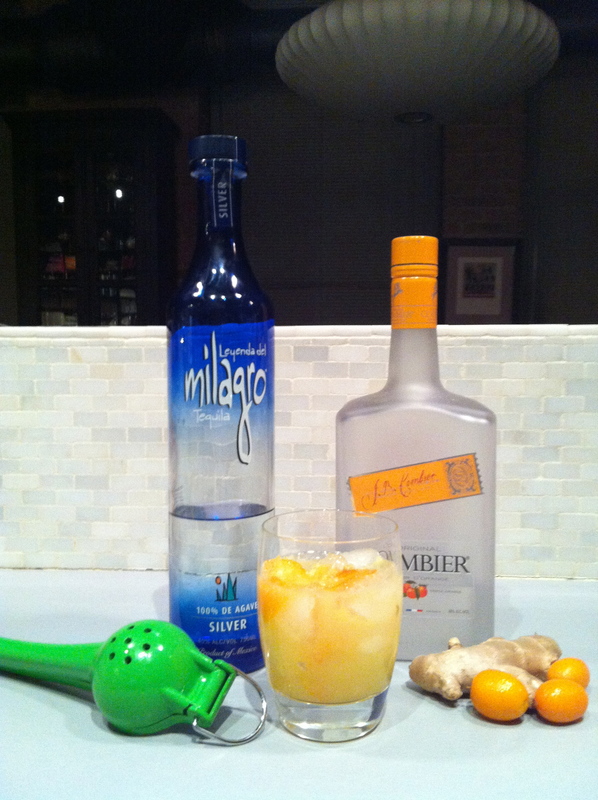 Preparation: Muddle the ginger, kumquats and sugar in the bottom of the mixing glass. Add the tequila, orange liqueur, lime juice and enough ice cubes to fill a rocks glass. Shake in cocktail shaker and pour unstrained into the rocks glass. 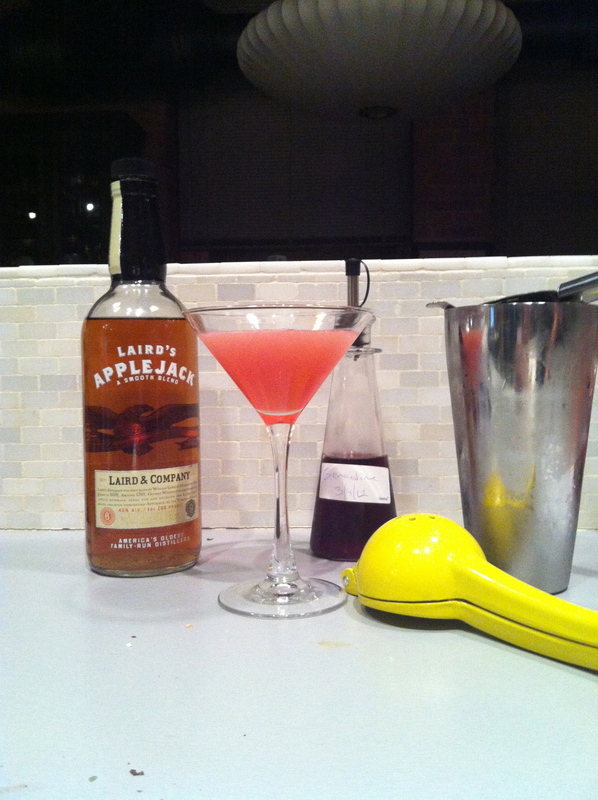 This is a recipe from the book Speakeasy by Jason Kosmas and Dushan Zaric of Employees Only in New York City. Note: I was not able to locate the Rhum Clemente Creole Shrubb, which is a rum based orange liqueur, so I substituted Combier instead. I suspect that the Shrubb adds some depth the drink because mine initially ended up a bit too heavy on the citrus and sweet side for my taste, so I also added 2 dashes of Bittercube’s Jamaican 1 Bitters (primarily a Ginger and Black Pepper flavor profile) and that did the trick for me. I’d like to get my hands on a bottle of Shrubb sometime and see what the recipe in its original incarnation is like, but I was so fond of the Winter Season Ginger Smash that I couldn’t resist buying some kumquats and trying to make do with what I have at home. Preparation: Combine ingredients into a mixing glass. Add ice and stir for 20 seconds. Garnish with a sprig of mint. This recipe is from the book Speakeasy by Jason Kosmas and Dushan Zaric of Employees Only in New York City. Preparation: Combine all ingredients into a mixing glass. Pour into an ice filled cocktail shaker. Shake for 10 seconds. Strain into a chilled cocktail glass. This recipe is from the book Speakeasy by Jason Kosmas & Dushan Zaric of Employees Only in New York City. The history of the drink is somewhat unclear. The more colorful story is that it was created in 1912 or 1913 in honor of a famous gambler named Jacob Rosenzweig, aka Jack Rose, while the more likely explanation involves a combination of its primary ingredient, AppleJack, and the rose color resulting from the grenadine. It was a very popular drink in it’s day and is listed as one the six basic drinks in the classic cocktail book The Fine Art of Mixing Drinks by David A. Embury. Preparation: Combine ingredients into a mixing glass. Add ice and stir for 20 seconds. Strain over large ice into a double old-fashioned glass. Garnish with a slice of apple. This recipe is attribute to Phil Ward of the restaurant Mayahuel in New York City. I came across it researching cocktails using Mezcal on the aptly named website mezcal.com. Preparation: Combine ingredients into a mixing glass and pour into an ice-filled cocktail shaker. Shake for 10 seconds. Strain into a cocktail glass. This recipe is identical to the Oriental Cocktail except that it substitutes Irish Whiskey for Rye Whiskey.